Mind mapping is only one flavor of visual thinking. Here’s a challenge to “think visual” – to engage in out-of-the-box thinking to further your career and your life, using more of the tools at your disposal. Apple’s 1997 Think Different ad campaign celebrated creative people in all their rebellious glory. Part of that campaign was a manifesto, which is represented here in the form of a colorful mind map. 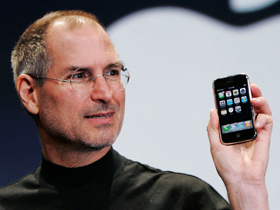 Steve Jobs, the iconic co-founder and leader of Apple Computer, passed away yesterday at the age of 56. This mind map summarizes some of the vital life lessons he taught us through word and deed. How can you think like Steve Jobs? Here’s a mind map to inspire your thinking in some “insanely different” directions.